Signature guitars are an interesting lot. Because these models are designed to address the specific needs and desires of one individual pro player, they are sometimes singular in their purpose (and tone), and not as well suited to players who need instruments with more diverse feature sets or tonal options. Happily, the line of Ibanez Joe Satriani signature guitars are not so narrow-minded, delivering a wide range of beautiful tones and effortless playability. You don’t have to be a shredder to enjoy playing them — these are very comfortable instruments with great necks that are far more Strat-like than any other Ibanez you may have played. They even include some not-so-obvious features that are sure to please the clean tone champions among our readers. JS2400 = 3.6, which earns it a WIHO Award! Rock guitarists familiar with the Ibanez RG- and S-series guitars will be in for a radical surprise when they play a JS guitar, as the necks feel nothing like the Wizard necks found on those iconic instruments. Instead of thin necks with flat fretboards, the JS guitars feature gently curved fretboards, rolled fret edges, a soft C-shape… with your eyes closed, you’d never know you were even playing an Ibanez guitar. From the flashy looks of the JS20S with its Marvel Comics artwork to the subtle beauty of the new JS2400 to the over-the-top hand-drawn artwork adorning the JSBDG, there’s plenty of good stuff to choose from — and these are just a few of the guitars in the JS line! With lightweight basswood bodies and rounded edges — it looks almost like an S-series guitar mutated into a comic book caption bubble, you’ll enjoy playing extended marathon sessions with any one of these guitars slung around your neck. The JS line of guitars covers a wide range of prices. Fortunately, the guitars are nearly identical in their features, materials, and neck specifications, leaving you free to pick the model that best represents your personal sense of style and tone (other than the entry model JS100 and the flashy JS20S). JS2400, Joe’s new signature model featuring the only notable differences from other JS models: a 24-fret neck and a different neck pickup. Although we didn’t get to review the JS1200, it has been included for comparison because it is nearly identical to the more costly JSBDG model. Most JS models are made in Japan, but the limited availability JS20S and entry-level JS100 (not tested) are currently made in Indonesia. The first batch of JS20S guitars were made in Korea, though, so don’t be surprised if you see this country of origin on the headstock instead. All models, though, feature a lightweight basswood body and bolt-on maple necks with rosewood fingerboards. The JS20S has a standard JS neck, but the two other models reviewed feature a JS Prestige neck. 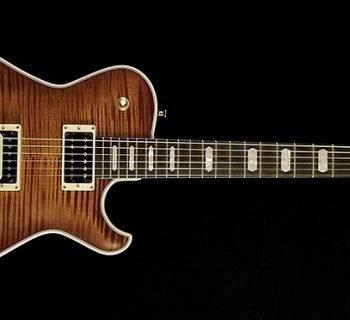 The JS2400 and JSBG guitars are built by the J-Craft team (the Prestige and Team J-Craft designations signify manufacturing by the top Ibanez luthiers, similar to what other companies call their custom shop). Regardless of the model, all necks feature nearly identical specs: 25.5” scale, compound radius (250mm), 42mm wide at the nut, 56mm wide at the last fret. The Prestige necks are exact digital replicas of Joe’s favorite personal guitar neck. The JS20S has medium frets, but all other models feature Warmoth 6105 jumbo frets. Each neck is finished with a Satin coat on the back. All JS-series guitars feature a pair of humbucking pickups, and they all utilize a three-way selection switch for bridge, bridge-plus-neck, and neck positions. At a glance, it’s easy to assume that the new JS2400 has a single-coil pickup in the neck, but actually, the Pro Track is a full humbucking pickup, designed originally as a drop-in replacement pickup for Fender Stratocasters. The output of the Pro Track is meant to deliver vintage PAF tone, whereas the PAF Pro was designed with a vintage PAF vibe, but adds more presence and a mid-range EQ bump that gives it a “subtle aw vowel sound” according to DiMarzio. The PAF Joe, found on the JS1200, is designed to combine tonal qualities from a PAF and late ‘50s Gibson humbucker. 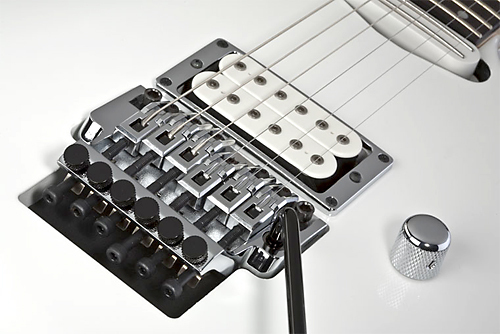 All of the humbuckers are ring-mounted except for the DiMarzio Pro Track, which is direct mounted to the body. Many players believe that you can get more excited harmonics from pickups that are ring mounted instead of directly to the wood. Given that Satriani is a masterful player of musical harmonics, these guitars certainly reinforce the notion that how you mount your pickups to a guitar body is a function of tone and not just an issue of cost. The single tone control is a push-pull knob that doubles as a coil tap, delivering single-coil tone in all three positions. On all models other than the JS20S (and the entry level JS100), the Volume knob is also a push-pull pot, delivering a very cool feature sure to appeal to players who spend plenty of time on acoustic passages: a hi-pass filter! When pulled, a ceramic capacitor is engaged in the tone circuit, and this capacitor’s purpose is to preserve the quality of your clean tone while you roll off the volume so you don’t lose any high frequencies. Edge: Most similar to an original Floyd Rose, but features a pop-in tremolo arm, locking studs (improved tuning stability), and requires cutting the balls off of string ends. Edge III: Similar to the original Edge, but it has lower-profile fine tuners that are angled rear-facing to avoid accidental adjustments, and the size of the saddles have been increased. Balls do not have to be removed. The JS20S includes a red Planet Waves Satriani strap, some anniversary guitar picks with Joe’s signature on them, and an instrument cable. 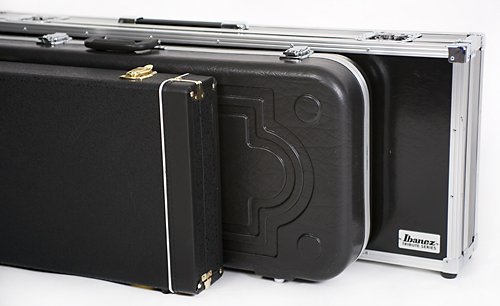 It ships in a traditional hard case. 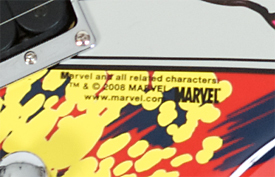 Our one negative comment about this guitar: the Marvel Comics copyright notice is boldly printed right on the face of the artwork below the bridge pickup. It’s a distracting element placed in a far-too-visible location, and it cheapens the look of the guitar. From stage distance, of course, nobody will notice. The JS2400 ships in a plastic molded case with the J-Craft logo, and it includes a cool multi-tool device in the case as a gift. The JSBDG ships in an ATA-style touring case, includes a black Planet Waves Satriani strap, and anniversary picks with Joe’s signature. But that’s just the tip of the iceberg. You also get the recently re-mastered “Surfing With The Alien” deluxe edition CD, hand-signed by Joe Satriani, and an official certificate of authenticity, also hand-signed, mounted in a glass display frame ready to hang on your wall. All three of the Satriani signature models tested played well, but the JS2400 and JSBDG went beyond well and into the fantastic category thanks to their Prestige necks adorned with Dunlop 6105 frets. They felt dreamy, like well-worn Strats that were effortless to fly across, vintage in vibe from the rounded edges of the frets and the C-curve back, yet modern in their fast playability. The JS20S, by contrast, felt more like an import-model Strat — comfortable and familiar, but without anything specifically outstanding about the feel. The action was set up a bit higher than on the two premium models, which contributed to it playing more typically (and slower) than the other models. The lack of an obtrusive neck heel meant that on the 22-fret JSBDG and the JS20S, we had no problem playing whatever high notes called out to us, and despite the two additional frets on the JS2400, we never really noticed a difference switching from one Satch guitar to the next. 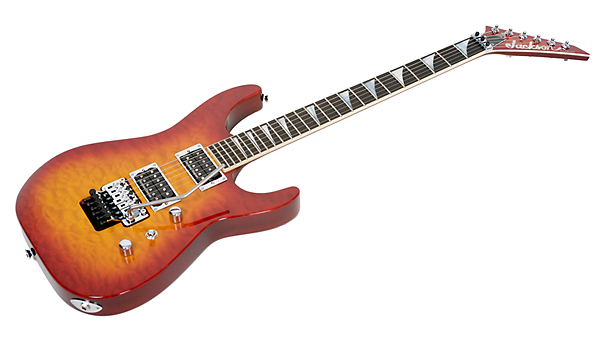 Ibanez did a great job of preserving the familiar feel and balance of the 22-fret JS models with the new 24-fret JS2400. Although all of the guitars have a Satin coat on the neck, the JS20S and JS2400 felt almost like there was no finish on them at all, whereas the JSBDG had a more pronounced Satin feel. This difference could be attributed to the hand finishing work on the pricier model. The biggest usability difference between each of these guitars, however, came from the input jacks, which varied on each model. The JSBDG took top honors with the jack mounted flush with the edge of the guitar, but on the JS2400, its angled input jack caused minor annoyances when we played through a rig using our Shure SLX wireless system and its premium Shure right-angled cable — it wasn’t able to route straight back or up the side of our guitar to the transmitter on our strap, though it was usable. We had to re-do our comparison testing of the guitars when we attempted to play the JS20S, though. It has a deeply recessed jack, and it was impossible for us to plug in our right-angled cable at all. This guitar requires using a straight-end cable, whether wired to an amp or to your wireless transmitter (perhaps that’s why an inexpensive cable is provided with the guitar — just in case you’re ready to rock but find yourself unable to use your premium cable). The guitars are each lightweight and feel extremely comfortable for extended jam sessions. The rounded edges and contours of the JS series guitars may look funny to some players, but they felt great whether standing or sitting down. The JS series guitars sound as good as they look (or even better than that if you’re not crazy about the unique body style). The JS2400 and JSBDG are great sounding instruments, with the JSBDG sounding truly exceptional. 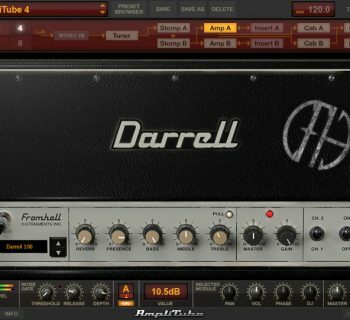 We tested the guitars through a variety of high-end tube rigs including an ENGL e580/850 rig and a Mesa/Boogie Road King II, two amps that deliver an extremely wide array of tones from super-clean to vintage classic rock to modern high-gain shred. The hi-pass filter on the Volume knob of the JS2400 and JSBDG was a really fantastic feature that worked great. Pulling this knob to its out/up position, rolling off the volume did not result in the loss of any high frequencies in our tone. 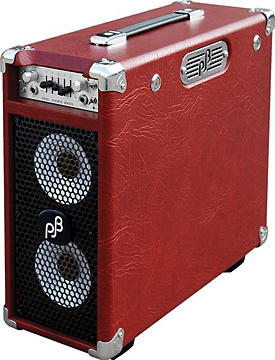 With the Volume knob in its normal/down position, rolling off the volume resulted in a high-frequency loss, typical behavior with virtually all magnetic pickups. Both the JS2400 and JSBDG had excellent sustain, and their pickups (medium gain by DiMarzio standards) easily drove our high-gain tones. Soloing was blissful as both the neck and bridge positions delivered fantastic clarity, and the neck pickups — both the Pro Track and PAF Pro — were capable of delivering beautiful fluty tones. Where the guitars differed sonically were only in the subtleties. The JS2400 had a slightly more acoustic, woody tone than the JSBDG, which was apparent mostly on clean tones as well as some of our high-gain sounds. It seemed like there was just a hair more brightness to the tone from the JS2400, and a little bit more “spank” for funky clean rhythms, while the JSBDG had a slightly darker character to its tone. If flutey, high-gain tones for soloing in the neck position are you bread and butter, though, we give the edge to the JSBDG, whose DiMarzio PAF Pro had just a little more smoothness and substance to its tone than the Pro Track neck pickup in the JS2400. You don’t have to spend a fortune for this tone, though, since the DiMarzio PAF Joe neck pickup in the JS1200 guitar delivers similar performance characteristics (and you could easily swap in a PAF Pro later if you don’t care for the tone of a PAF Joe). We’re surprised that the limited availability JS20S didn’t include the same DiMarzio pickups as found on most other Satriani signature guitars, and instead included some Ibanez-manufactured AH1 and AH2 humbuckers that appear on the entry-level JS100. While this guitar was good at delivering bright, clean Strat-like tones, the pickups didn’t have the same depth of character as the DiMarzios, and with high-gain tones, they lacked clarity with some complex chord shapes. They were also noisier than the DiMarzio pickups, more obviously when running the pickups in single-coil mode, and more prone to unwanted feedback when positioned close to our amps on extremely overdriven tones. We also experienced a disturbing volume cut on the JS20’s Volume control near the bottom of the range. As we rolled off the volume, at a certain point near the bottom, the volume cut out directly/instantly (prematurely). On the other guitars, there was a smooth, tapered volume roll-off as we decreased instrument volume all the way down to zero. The Ibanez JS20S and JS2400 each shipped with documentation that covered setup and adjustments for multiple guitar models, and detailed setup of each of the different tremolo systems. The JSBDG didn’t include instructions, but Ibanez has extensive details for adjusting their guitars and guitar hardware in the Support section of their website. With the exception of the JSBDG, these are well priced signature guitars. We’re on the fence regarding pricing of the JSBDG model because there’s nothing exotic about the build compared to other guitars in the JS line — you’re paying primarily for the hand-drawn artwork adorning the instrument (though it is spectacular) and a bit more hand finishing throughout the construction. With some other signature/anniversary models we’ve reviewed, a significant price jump is typically because of a change in building materials, like a special edition made from Korina or Koa woods. 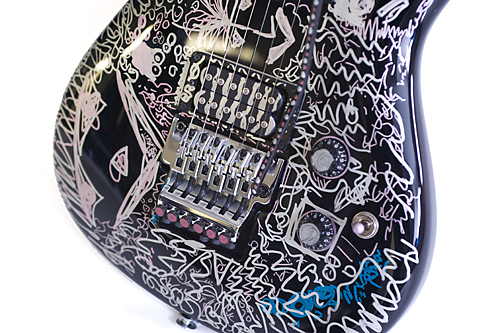 In this case, you’re paying strictly for the artistry, and while the artwork was expertly drawn by Ibanez artists in the style of Joe’s famous doodling, it would have been more special to us if Joe himself had drawn original art on these guitars. Heck, we’d even pay even more for that!